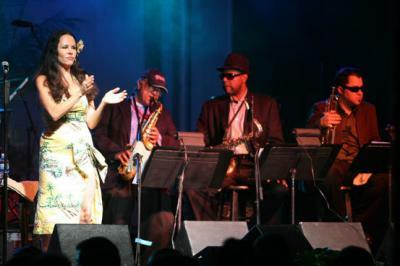 The 7th Annual Duck Jazz Festival took place on Sunday, October 13, 2013. Approximately 5,000 people visited Duck for the event. In addition to the main performances, festival headliner, Delfeayo Marsalis, led an afternoon workshop with approximately 70 middle school and high school students from the First Flight and Manteo schools. Born in New Orleans, Delfeayo Marsalis was destined to a life in music. One of the top jazz trombonists performing today, Marsalis has won multiple Grammy Awards for his musicianship. He is equally accomplished as a producer and arranger having produced over 100 recordings for major artists including Harry Connick, Jr, Spike Lee, Nicholas Payton, and for his brothers Ellis, Branford, and Wynton Marsalis. As a bandleader, he has earned wide acclaim, especially for his albums Pontius Pilate’s Decision (1992), Musashi (1997) and Minions Dominion (2006). He brings all of his talents to bear on his most ambitious project yet: Sweet Thunder. Using the Duke Ellington/Billy Strayhorn suite Such Sweet Thunder as the point of departure for his octet, Marsalis has created a fresh, new musical composition. With a singing style influenced by Billie Holiday, Dinah Washington, Bessie Smith, Little Esther Phillips and other legendary greats, Lavay Smith has become an internationally recognized Diva of Jazz and Blues. As the vocalist and leader of her 7-piece band, Lavay creates her own compositions and draws from a large repertoire of classics. The band features some of the world’s finest musicians and is comprised of four horns (trumpet, trombone, alto saxophone and tenor saxophone), piano, bass, and drums. These top of the class musicians have performed or recorded with Duke Ellington, Ella Fitzgerald, Nat “King” Cole, Johnny Otis, Ray Charles, Big Mama Thornton and many, many more. The combination of world-class singing and musicianship provides the perfect recipe for dancing and good times. Peter Lamb and The Wolves is a North Carolina-based band formed by saxophonist Peter Lamb in 2008. The music features strange eclectic melodies and sounds from around the world, combined with a funky New Orleans groove. Lamb leads on tenor saxophone, aided by Al Strong on trumpet, Stephen Coffman on drums, and two musicians doing double duty-troubadour—Mark Wells on vocals and piano, and George Knott handling upright bass as well as the elephantine bass saxophone. Their repertoire reaches back to New Orleans’ earliest syncopaters, but also forward to hipster bards like Bob Dylan and Tom Waits; a tango might trip on the heels of a French waltz or a Russian folk song. Carroll Dashiell is a native of Washington, D.C. A graduate of Howard University, with citations in Who’s Who in Music and Down Beat Magazine, Carroll has been recognized for excellence in the music industry as a bassist, musical director/conductor and also as a composer/arranger. His performance history includes concerts with the Boston Pops, National Symphony and Washington Philharmonic Orchestras; performance dates with Dr. Billy Taylor, Ethel Ennis and the Fifth Dimension; in addition to concert and Broadway show tours with Maurice Hines, Stephanie Mills, Maceo Parker, the genius Mr. Ray Charles, Vanessa Rubin and Jennifer Holiday. Dashiell is currently the Director of Jazz Ensembles and String/Electric Bass Professor at the East Carolina University School of Music.